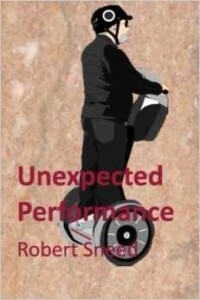 UNEXPECTED PERFORMANCE explores the experiences of D.J. Cuddles, an audio host at Benburger Museum, the home of the late George and Beatrice Benburger. The story takes place during the Christmas season giving insight into the life of the Benburger family during the Hanging of the Greens ceremony. Becoming bored with the daily Christmas offerings of music at the museum,D.J, and co-worker Lily Bejon come up with the brilliant idea of creating a Segway PT unit ballet to be performed during Twelfth Night Festival. After much preparation and training, the performance night arrives only to be interrupted just before the ballet is to begin creating an unexpected performance.